For many people the idea of obesity surgery conjures up the idea of a miracle cure in hospital and then a life of weight control made easy. Many weight loss surgery providers would have you believe this is true! Patients often find themselves lost in a new world of post bariatric treatment nutritional chaos, severely let down by a lack of support when they choose to have treatment abroad or they simply find that their UK provider does not offer adequate aftercare and guidance. Many of our team have been there themselves. We know how it feels to struggle every day with your weight, and we know how to help you break that cycle! For the National Obesity Surgery Centre, being number one in the UK is about so much more than simply the number of bariatric procedures we undertake, or even the wide range of different procedures we can offer. We do not see patients in terms of numbers, but as individuals, who need individual support and the right solution to their unique needs. At the National Obesity Surgery Centre we understand that the real key to effective long term control of obesity is to change your behaviour and relationship with food. To that end we have developed B.A.B.S. 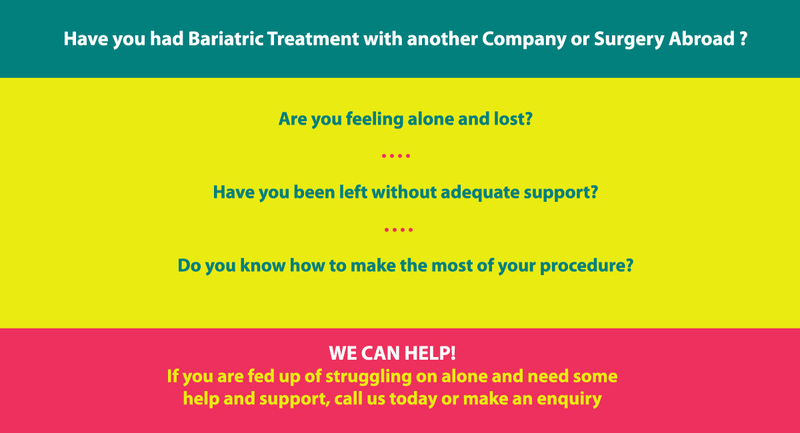 our bariatric support programme. The B.A.B.S. Programme is a unique interactive online aftercare and weight loss support programme which, in conjunction with proven obesity treatments, will answer all your questions and help you to take back control by developing a healthy relationship with food. It is this long-term aftercare programme that makes the difference between long-term success and short-term gain. The programme will help you to reshape the way you see food and eating as separate entities to help you to better understand the way to manage that relationship in the future. You will work with our support team who will offer understanding and practical advice to help you through even the most difficult periods. At the National Obesity Surgery Centre we have unrivalled experience in the long term management of post procedure weight loss. The success of the B.A.B.S. Programme can be seen in the way it has helped to transform the lives of many bariatric patients, giving them back control over their relationship with food and allowing them to live healthier more fulfilling lives. All our Patient Support Advisors are qualified Nutritionists or Nutritional Therapists. NOSC Patients who would like to extend their support programme. Bariatric patients who have had treatment elsewhere including abroad. You will be allocated a dedicated Patient Support Advisor who will guide you through the whole programme. What else is included in B.A.B.S? How much does B.A.B.S. cost? £795.00 for the 12 month package - only £66.25 per month ! £695.00 for existing NOSC patients who would like to extend their support for a further 12 months – Less than £58.00 per month. For an additional £25.00 we can arrange a telephone consultation with our Personal Trainer who will design a bespoke activity programme for you - Usual price £50.00.